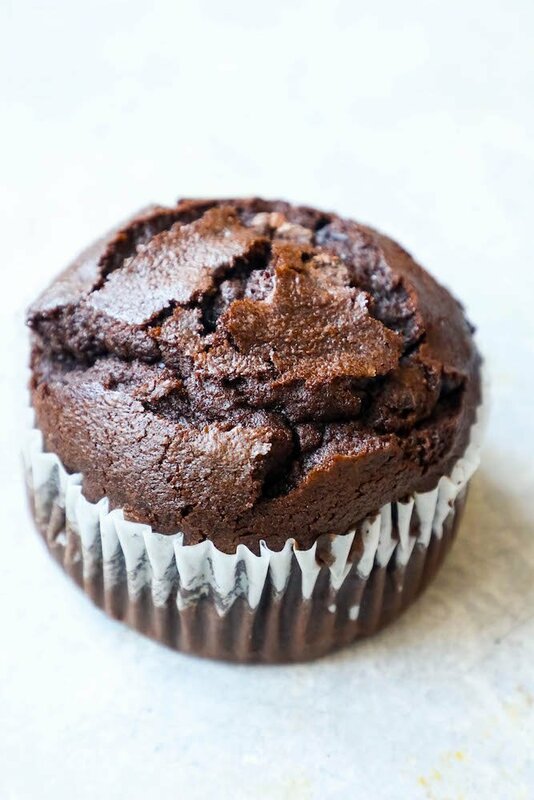 Easy Double Chocolate Chunk Muffins Recipe – delicious, fluffy and moist double chocolate chunk muffins are bursting with chocolate flavor – and tons of chunks of chocolate in every bite! 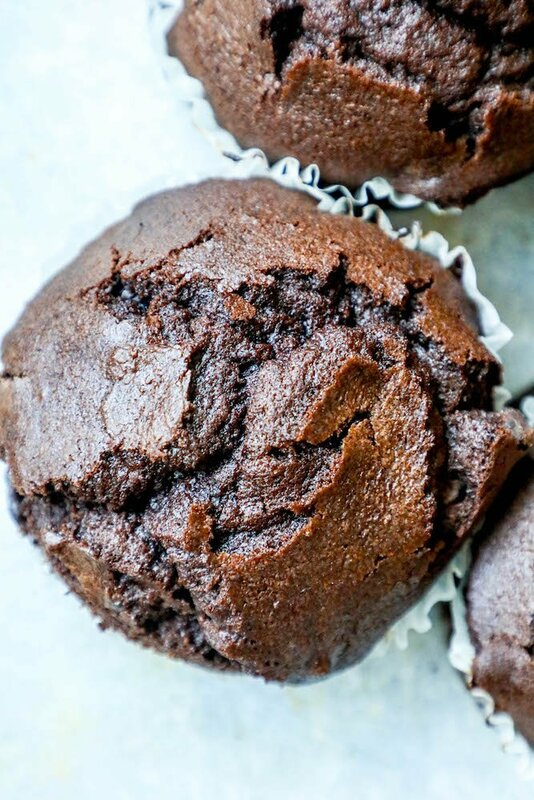 These super chocolatey muffins are loaded with cocoa and big chunks of chocolate – just like from a bakery, but about a million times better. These muffins are super simple – no need to separate wet and dry ingredients – just mix, scoop into a pan, and bake! Just Take Me to the Double Chocolate Chunk Muffins Recipe Already! 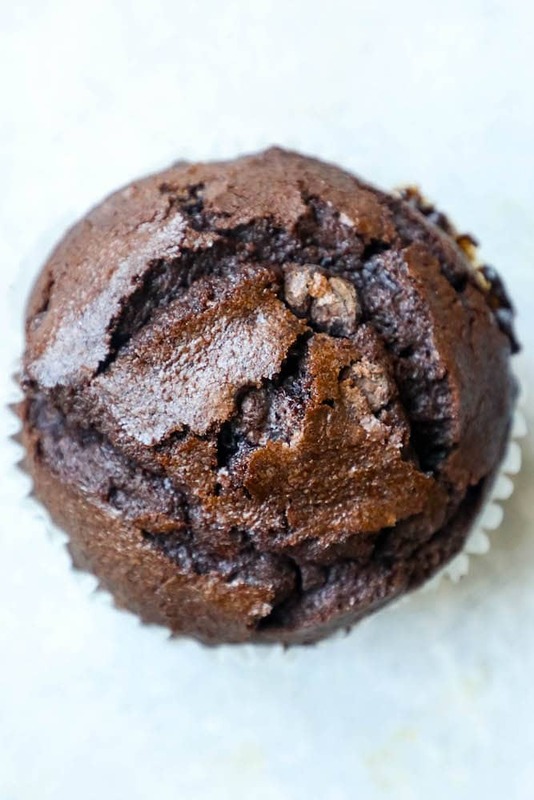 If you want to skip over my tips and tricks to making deliciously light and moist double chocolate chunk muffins, please scroll to the bottom of the page. I get a ton of questions and comments on my recipes, so I try to provide as much information as possible for my readers. 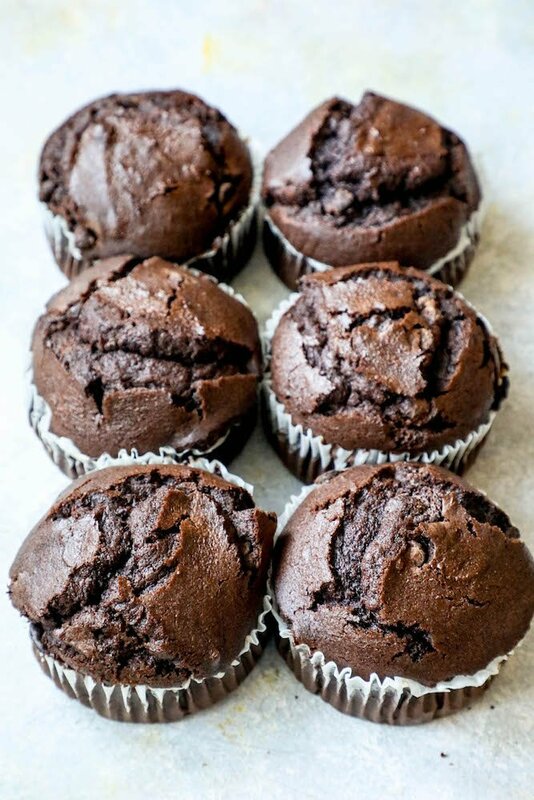 Just a few tips and tricks below, and you’ll be on your way to delicious muffins packed with tons of chocolate flavor and chocolate chunks for a perfect jumbo double chocolate muffin recipe everyone loves! To get perfect high-domed muffins like you would in a bakery at home, there is a specific process to get the best results. -Bake Jumbo Muffins 5-10 minutes more than you would regular muffins. -Use a spatula or a spoon to mix muffins, not a mixer. -Refrigerate dough, covered, for at least one hour after mixing, up to overnight. -Preheat the oven to 425 degrees. -Bake muffins for about 6-8 minutes (until they have risen just past the muffin cup top) at 425 degrees. -Reduce heat to 350 for the second half of baking. -Always let muffins cool on a rack instead of in the pan, as leaving muffins in the pan will make the bottoms soggy as the steam we used to build a high domed muffin gets trapped and makes the texture soggy! These muffins are great for meal prep since they can be frozen easily if you have too many, or if you’d like to have them portioned out individually. -Tightly wrap each muffin in plastic wrap. -Add plastic wrapped muffins to a large freezer sized ziploc bag and freeze for up to 6 months. -When ready to eat, let muffin thaw naturally overnight in the refrigerator or in a cool, dry place. -Pop in the oven or microwave to warm, and enjoy! 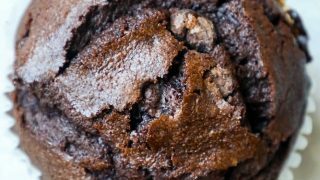 If you love these double chocolate chunk muffins, please check out some of my other favorite recipes! 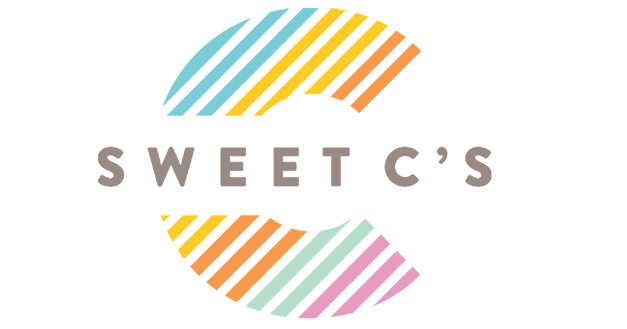 To shop my favorite baking essentials, please visit my Amazon storefront here. 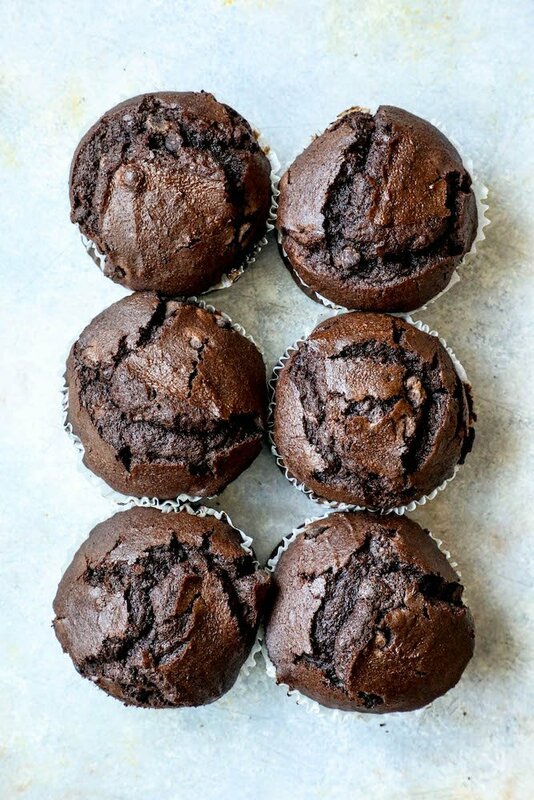 If you love this easy double chocolate muffin recipe as much as I do, please give it a five star review and help me share on facebook and pinterest! 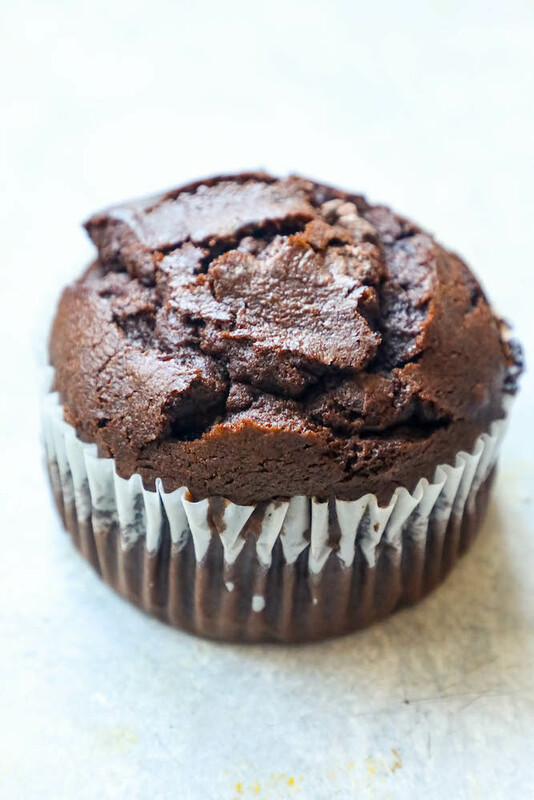 Easy Double Chocolate Chunk Muffins Recipe - delicious, fluffy and moist double chocolate chunk muffins are bursting with chocolate flavor - and tons of chunks of chocolate in every bite! In a large bowl, sift together the flour, cocoa powder, baking powder, baking soda, and salt. Make a well in the middle and add in eggs and vanilla, whisking vigorously. Using a large spoon, mix rest of ingredients in to muffins until large clumps are gone and batter is consistently mixed - but do not overwork muffin batter. Cover batter and refrigerate for one hour to overnight. Bake at 425 for 6-10 minutes, until muffins have puffed slightly above muffin liner. Triedthese muffins today, very yummy. Thanks for the tips. My son is just asking for one more. I just tried this recipe and was not sure about it, because it was thick or at least thicker than what I expected, but it turned out amazing! I’m so happy and proud of my chocolate muffins! Thank you! This recipe looks really good, but do you happen to have any advice for converting it to regular cupcake\muffin tin size? I don’t have a jumbo tin but I’d still love to try and make it. Thank you for reading this! Hi Anna – you can convert the recipe to be 12 regular sized muffins, and count on about 10 minutes less cooktime! am I reading this right? 852 calories and 123 grams of carbs! Is that even possible! not fitting in to my world. Sorry! There is nothing better than a giant chocolate muffin for breakfast! Our kids devoured these muffins in no time at all! They were amazing! Oh those look so delicious! Nothing better then a chocolate muffin! These are the best! Love chocolate & so do my kids! Perfect for a treat or breakfast! My kids loved these muffins!! They can’t wait to try it again!